Products- How Can I Except Some Man Should Guide Me? How Can I Except Some Man Should Guide Me? Are you looking for a book that can help you in guiding a child to faith in Jesus Christ? This is the one! How Can I contains 12 chapters on child rearing and Scripture memorization designed to give the child a thorough exposure to Bible- based salvation. The book includes 150 perforated card stock memory cards, with those 150 Bible verses divided under the headings of doctrine, defilement, detection, destination, deliverer, delay, and duty. The child is rotated through these topics in a thorough manner giving them a well-rounded look at the Bible plan of salvation. 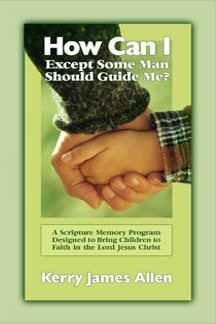 The book can be used with children old enough to begin memorization as well as in Sunday School classes. Many churches order in quantity, with one church recently ordering 50 copies. If you need a larger quantity the shipping cost can be reduced, but the books are basically sold at our cost, which is $10 per copy. The book makes a great gift for new parents, and we also have missionaries that use them on the field. If you have any questions direct them to Pastor Allen here.